Early in my career I had the privilege of working with an all Native-American Board of a foundation in the northwest and with the Board of a Buddhist Monastery. In each meeting, they taught me the power of silences: both spontaneous and planned. People around the world cultivate silence as a source of equanimity, creativity, and wisdom. For example, silence is an essential element in indigenous ways of knowing and healing as well as in Buddhist approaches to contemplative practice. When facilitating the group of Native American leaders, after talking for a period of time, they would fall silent. Inevitably, one of the elders in the group would break the silence with a story or an image, something that was coming to him or her that was pertinent to the decision they were trying to make or the issue with which they were wrestling. The Buddhist Board members decided to start their deliberations with a silent meditation and then pause for a few breaths after each person spoke. Through these planned silences, they hoped to clarify their individual intentions and more fully take in and understand what each person had said. It is challenging to incorporate silences into meetings driven by full agendas and deadlines. And, yet, I frequently notice that incorporating moments of silence and reflection open doors to deeper listening to individuals and the group as a whole, along with creativity and new ways of thinking. Brief pauses allow us to bridge between our inner experience and our outer expressions. In even brief moments of silence we can become aware of our thoughts, emotions and body sensations and notice whether they are consistent with our most important values and intentions. In other words, with periodic silence, we are better able to listen to ourselves, others, and the group as a whole. We can inquire into what the larger context might be communicating to us, wanting from us. The context could be the organization or community. It might even include listening to those who are not yet born. What might my great-grandchildren want me to say or do right now? 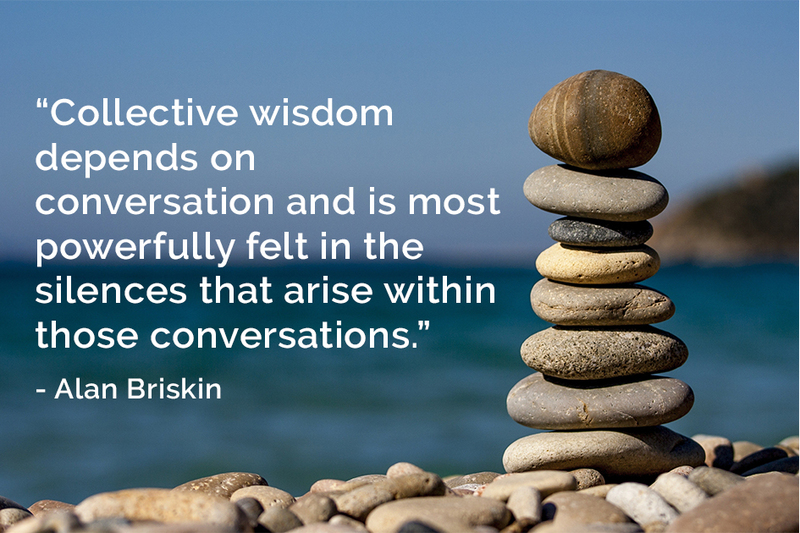 When we cultivate quiet inside ourselves and invite silences in meetings, we create the possibility that we can step off the train of continuous, often repetitive thinking and speaking, connect with others, create space for inquiry, and enable collective wisdom to emerge. Experiment with inviting silence now and then in your meetings and notice what happens. They’re busy, but are they productive? Hi Mary, I found this blog entry especially useful. As an extrovert who loves to talk and keep things moving, I have often been uncomfortable with silence in groups. In this entry I found some very useful tips and reasons for honoring silence. I am going to try some of these in the next meeting of a group I am in working on racial healing and reconciliation. Hopefully, I can model for others how this works.